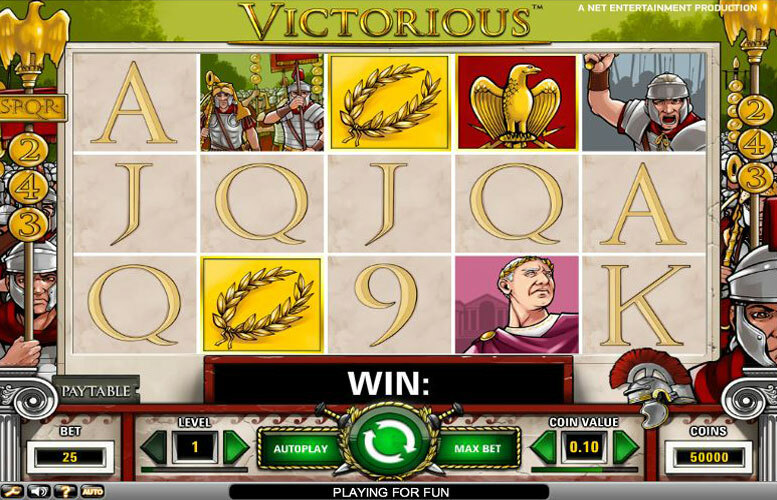 Victorious is a gladiator themed slot machine which offers players the chance to trigger free spins (up to 25 at once) and multiply their bet amount by x500 with the scatter symbol. It plays across 243 ways so you never miss a winning combo and the top prize is 45,000 coins! The Roman Empire is one of the great ancient civilizations as well as being the inspiration for this five reel slot machine which works with 243 bet ways, as opposed to paylines, which means all combinations of winners are covered each time you spin. This game has players choose only a coin value and bet level, which can go up to ten for a total of 250 credits being bet per spin. The top payout is 45,000 coins at the maximum bet and in terms of specials the game only features a free spin and a wild symbol. Players are accompanied by loud music that sounds similar to a march and gives an epic feel to the game, although it has a lot of bright colors and some detail, there is not much in the way of animations. The game can get a little boring after a while with nothing but some free spins interrupting the gameplay but wins are frequent which is a big plus. 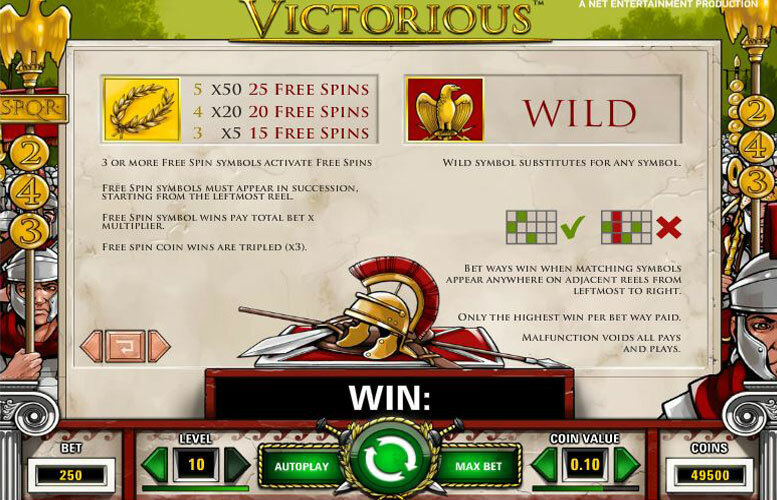 The top payout of 45,000 coins can be earned by getting five of the Caesar symbols on an active payline, which players must achieve during free spin rounds where you get a x3 multiplier added to all your winnings. To get the top payout, players must be using bet level ten, as the award is based on that amount. The second highest payout is 10,000 coins, which can be obtained by using bet level 10 and spinning five of the Gladiators. These would be the guys with the golden breastplates. Wild: The wild in this game is the golden eagle. It only works for the other symbols and does not make winning combinations of its own or multiply the wins that it does complete. Laurel Wreath: This golden, nature inspired headdress is the Free Spin symbol for the game. In this game, players have to get three or more on a payline in order to win. Free spin wins are tripled. Players are awarded for the combination in coins as well, which is a multiplier applied to the total bet. Three wreaths are a 5x multiplier and 15 free spins, four are 20x with 20 free spins, and five are 50 times the total bet plus 25 free spins. Caesar: The leader of the empire is the highest paying; players win 1,500 coins for five spanning the reels, four will pay 500 coins and three pays 100 coins. Gladiator (gold breastplate): This pays the second highest award of the game when using the maximum bet, which is equivalent to 1,000 coins for five on bet level one. Players are awarded 400 coins or 50 coins for four or three in a row, respectively. Solider (steel armor): Three in a row will pay 30 coins, four will apply 200 coins to be multiplied by the bet level. An award of 500 coins is paid for five. Soldiers: Easy to identify from the single soldier based on the number of faces that can actually be seen, this is the last of the picture icons. Players can win 20 coins, 100 coins, or 400 coins for three, four, or five in a row, respectively. A: The first of the golden letters pays 200 coins for spinning five that span the reels and 80 coins for four whilst three will only pay 12 coins. K: Players will still only get 12 coins for three of these, four are worth 40 coins and five are 150. Q or J: These two share equal payouts of 100 coins for five, 25 coins for four, and six coins for three matching. 10: This is almost equal to the Q and J, the only difference being a player wins 80 coins for five rather than 100 coins. 9: The final symbol of the game has the same payout as the 10, with one exception; the 9 is the only one in the game that will award for two on a payline, which pays 3 coins. Players can use coin value between 0.01 and 0.50. There are 10 bet levels, which allows players to further increase the amount per spin. Since players are not able to choose a number of lines to bet on, this machine works on ways, they start with a minimum bet of 25 coins per spin and this will go up to 250 at bet level ten. This means the minimum total bet is 0.25 and the maximum bet is 250. Players must use the maximum bet level in order to get the most out of the regular payouts. This game has a rating of 4 / 5 with 280 total reviews by the users.